I know some of these may be rumor, but since we already have the Wookiee Gunship #75084 – Unveiled at SDCC 2014 I thought we can start discussing the sets more seriously. I for one have been a huge fan of the Ralph McQuarrie concept and am glad to see that version of the Tie-Fighter and AT-ST.
UPdate: forgot to add this. Micro fighters don't Interest me much. I am curious about the troop transport and the shadow troopers. Seems like they would be good for some stormtroopers. I have the new ghost and phantom set from rebels. I really liked those so hopefully the other rebels sets will be just as good. Just glad we are moving on from battle droids. Always felt cheated when they were considered minifigs. @Mathias I agree with you on the battle droids...I will be buying the two rebels sets this week my kids have really taken to the show based on the 7 minute preview. I like the idea of the mini AT-AT as if like a few around my 8129 and new AT-AT. @jediami65‌ you mention am AT-ST, am I missing something or was it a typo? @joel4motion: Yes sorry that was a typo. My main interest in Star Wars is for the minifigures. So as an OT fan, this wave is a bit disappointing. I'm hoping for a Wedge with the Snowspeeder Microfighter. It will be interesting to see what is included with the T-16; a Biggs would be nice, preferably in a flight suit. I for one have been a huge fan of the Ralph McQuarrie concept and am glad to see that version of the Tie-Fighter and AT-ST. I realize you mention the AT-ST, here, but the AT-DP is based on concept art by Joe Johnston for ESB. I am curious about the troop transport and the shadow troopers. Seems like they would be good for some stormtroopers. I'd be excited about the transport if it weren't a Rebels set. Assuming the Stormtroopers look like the one in #75053, I'm not interested. What about them do you not like? Helmets? Printing? No idea why it rotated the picture. Did you guys notice that the dark Wookiee in the Wookiee gunship has arm printing. Could be the Wookiee's rank? 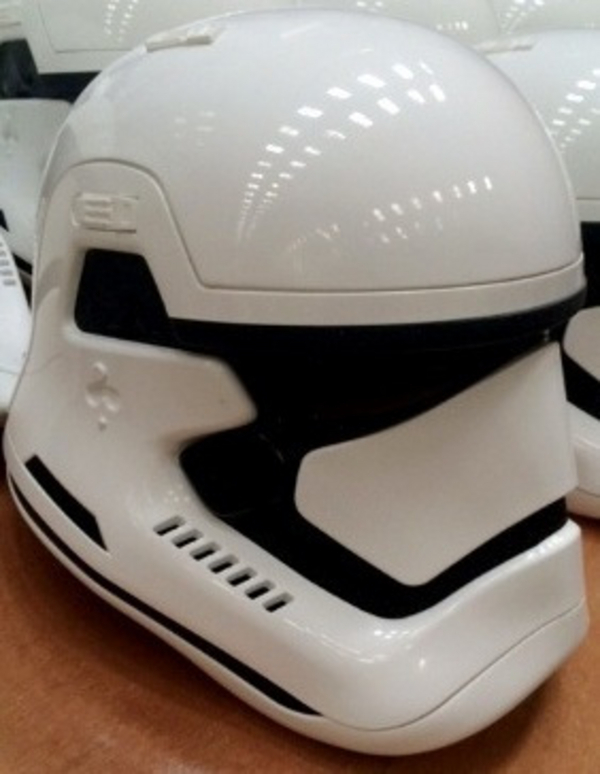 It's the very droopy mouths on the new (should that be old, if they're based 5 years before the OT?) stormtroopers that makes me dislike them. I would not be happy mixing those in my proper OT stormtrooper army. Oh, wow. Another T-16? This is only the second time they've made one, right? 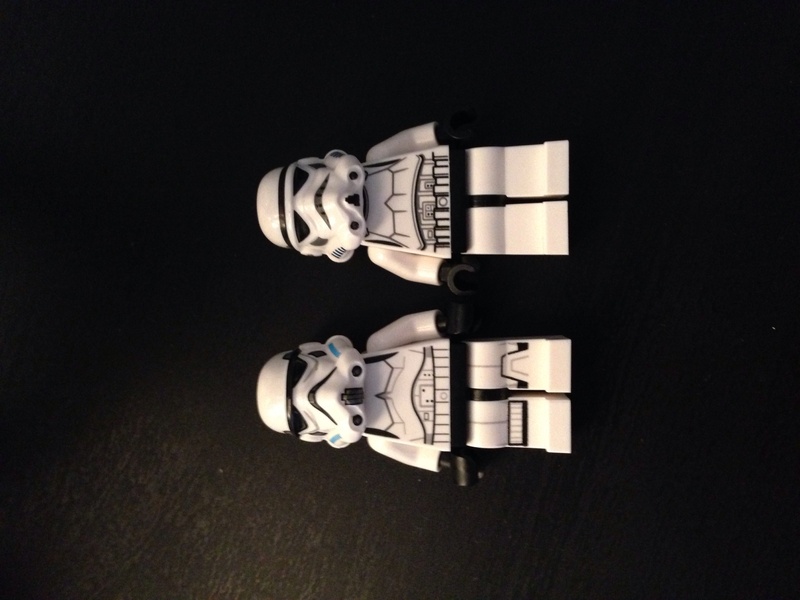 For me the cut-off printing on the legs is the worst element of the Star Wars: Rebels Stormtroopers. Only half of each kneepad is printed, which looks weird to me. The stylised helmet is accurate to the show, although I agree that it is not an ideal design. Haven't they done that half leg print on other stormtroopers before? To me i think its the helmet printing. The helmet itself looks to be the same mold but the printing is obviously different giving it more of a cartoon feel. For me it's the black line on the helmet actually touching the black of the eyes which gives it a low brow line like some sort of Neanderthal Stormie. Yes, the helmets. While I don't like the exaggerated mouth, at least it's accurate to the source. What I dislike most is the gray lines under the eyes. These are not accurate to the source, and what's worse, it has been carried over to the new OT versions ( #75052 and #75055 ). On the Rebels versions especially, it gives the effect a sleep-deprived junkie. For the OT, I really don't see what was wrong with the version in e.g. #9489. Sure, leg printing would have been nice with those. Ironically, I think the best version with leg printing is the Sandtroopers in #9490, but they've of course got sand on them. Helmets and torsos from #9489 with "clean" legs from #9490 would have been perfect, as far as I'm concerned. I agree completely. All stormtroopers I have except the rebels one are all from 9489. I just think overall it's a cleaner look. The droopy eyes and brow black line bother me a bunch. I definitely don't display it with my other stormtroopers. It stands out. @CCC - It would seem that LEGO really do just shove any Minifigures they have a surplus of into the Advent Calendars. I cannot believe we do not even get a new Snowtrooper but an old one! A proper, modern take on the T-16? Sweet. Imperial Troop transport would be great news if it were standard Stormtroopers and not the stylized ones. Vader Christmas is fine, as "Vader" is dutch for "Father". Or how about "Father Sithness? ^ I wish they'd done Vader's helmet in festive colours. that would decrease that misprint with red Vader's helmet by tons! I wonder how Darth Vader would look with the Santa hat instead of the black helmet? I wonder if he'll feel Luke's presents. Xo. Here is a link to a picture of a new DK book called LEGO Star Wars The Dark Side. It is offered in my son's latest Scholastic book catalog from school. I haven't seen it mentioned anywhere. Looks to offer The Emperor as the minifig. @jediami65‌ I agree about Palpatine's face. He looks like he has jaundice. For those that may not have seen this, there is new Storm-trooper helmet in EPVII at least that's what is being reported. So we should see these in the movie based Lego sets probably fall of 2015 since SWEP7 is slotted for Christmas 2015 release. It would also be perfect timing of another UCS set Falcon....me hopes. I wish we were getting a Stormtrooper battle pack that wasn't Rebels as well. I hope the T-16 Skyhopper is a Tatooine battle pack of some sort in disguise, to add to the Cantina and other sets. Otherwise some other OT purpose would be fine. Still no news on UCS Slave 1? nothing yet, its my guess that the Fan Expo might include something (star wars themed exclusive) if we don't hear anything at that show then I've no clue what to expect, I'm told its still on Lego store lists but no one knows anything more than that. We could all dream that the T-16 skyhopper would include a couple of Sandpeople and maybe even a Bantha for a longshot. 2015 info, this is one persons memory of photos of the sets he has seen. so take it for what it is. Imperial Troop Transport (75078) – Similar to the Imperial Landing Craft (7659) from 2007. There are four Stormtroopers. Shadow Troopers (75079) – Includes a small vehicle. Battle pack includes two Dark Guards which I assume could be the Emperor’s Shadow Guards and two Shadow Troopers. AAT (75080) – Jar Jar Binks makes his return in a LEGO Star Wars set. There will also be another Gungan minifigure. No mentioning if it’s just a generic Gungan or a major character like Boss Nass or Captain Roos Tarpals. The set also has a Battle Droid. Retail price is about £25. T-16 Skyhopper (75081) – Comes with some sort of pilot minifigure, a Tusken Raider, and a womp rat. According to Hulk_Smash at EB, who has seen the retailer catalog, there is a Tusken in the T-16 set, but no bantha. #75078 Imperial Troop Transport has four Stormtroopers (not sure if Rebels or OT, but it sounds like Rebels). #75079 Shadow Troopers has a vehicle, two Shadow Troopers, and two Shadow Guards. #75080 AAT has a battle droid and Jar Jar. #75081 T-16 Skyhopper has a pilot and a Tusken. #75083 AT-DP has a Stormtrooper and two officers. #75089 Geonosis Troopers has an AT-RT and camouflaged troopers similar to those in #75035 but brown. #75090 Ezra's Speeder Bike has at least one Stormtrooper. Most annoying (for me) is it's slated as a 'Rebels' release, which means they're likely to be droopy-faced sad sack troopers, and I flatly refuse to buy 'harry redknapp' troopers. I need something to stay uniform for my uniforms. It's been bloody impossible to buy a decent handful of OT stormies of ONE design lately. Every damn set they've appeared in over recent years has been slightly re-designed every time andalone. Aaagh! Most sadly, this set sounds the death knell for any prospect of a re-release of an OT stormy battlepack, and with new films coming soon, new film-designs will likely be the next lot they do, too. Hey, now. The 2012 version was in two sets and a book! @legomatt, "Harry redknapp"? Also the new OT troopers aren't bad. I have one from 75055. But it did get annoying., that the design kept changing. Most of my troopers are all from 9489. I do not care for the AAT. Anything droid related from prequels just doesn't do it for me. No one cares about jar jar. @Mathias, Oh agreed, I've no real problem with the new OT trooper, or any of the previous ones, I just wish OT stormtroopers would stick to a design for a spell, especially if they only give us one trooper fig in a wave, OR be included in greater numbers if they're always going to be redesigned with every wave. ^ Makes sense. I feel like the geonosis trooper battle pack is just a rehash of two older ones combined. ^ I didn't think there was I was just speculating, especially considering how late we are in the year. The Tumbler is the big September set. October seems unlikely as we've heard nothing. I don't remember any set of this size being released at the start of November or December, though I will be more than happy to be corrected. Wow, I didn't realize Arkham was considered a 2013 set. It was announced almost two years ago and available for sale at the tail end of 2012.